Are you looking for the best possible fit for your dash cover? 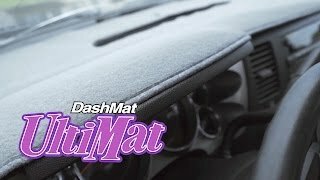 Our Ultimat DashMat takes dash covers to the next level by molding a dash cover for a precision-fit. This means there are no seams or darts. This is created by pressure molding one piece of fabric to the exact contours of your dashboard. We use a premium carpet material designed to not fray or unravel, while being colorfast, non-shrink, heat and UV resistant. This means you get a dash cover that fits great, looks great and will last the test of time. Just like our other DashMats these will also keep your dash protected from intense UV rays and heat so that your dash doesn't crack, fade, or deteriorate. Currently, this is primarily available for select trucks and SUV's, we are adding patterns all the time. Personalize it with added embroidery, logos, or even officially licensed Ford logos.